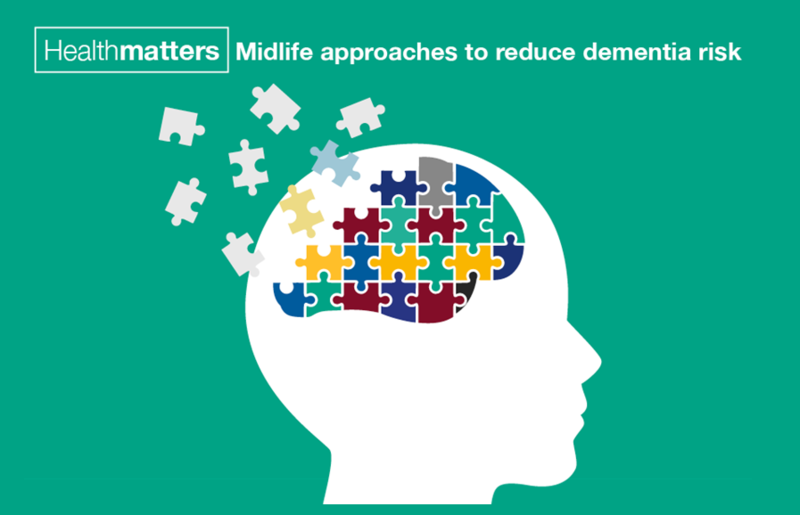 We hope that through the breadth of ‘Health Matters - Midlife approaches to reduce dementia risk’ content, we have made the case for investment of time and money in dementia prevention, but a question may remain; what tools and resources are available to support professionals in making an impact? NICE have produced guidance covering mid-life approached to delay or prevent the onset of dementia, disability and frailty in later life. It aims to increase the amount of time that people can be independent, healthy and active. PHE recently launched the first dementia profile. 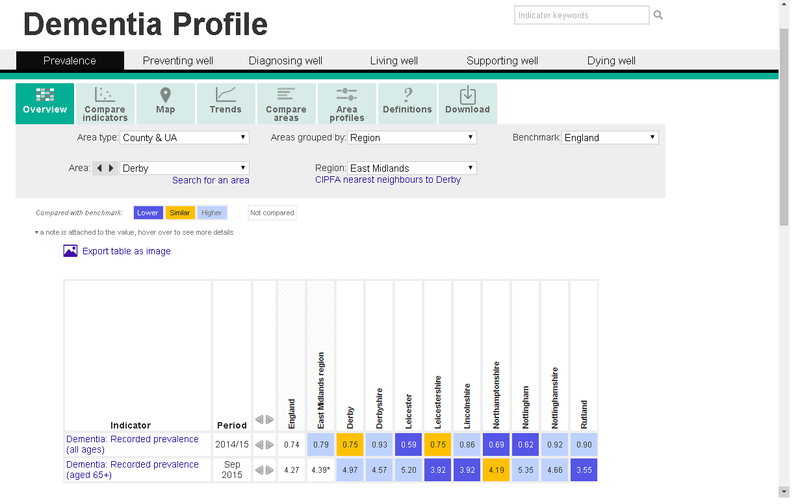 This is a tool that enables bespoke comparison and benchmarking for local authorities and CCG’s against other areas in England using one, easily accessible online platform. CCGs should use the data to look at local risk factors for dementia such as smoking prevalence, physical inactivity, excess weight and alcohol-related hospital admissions. This will help to prioritise efforts to reduce such risk factors. The data also shows local uptake of the NHS Health Checks. This resource lists and highlights all dementia data currently available at CCG and local authority level. This can be used as the first stage in ensuring all gaps in dementia data are filled and will stimulate conversation and joint working across organisations to make more data available for potential inclusion within our Dementia Profile. 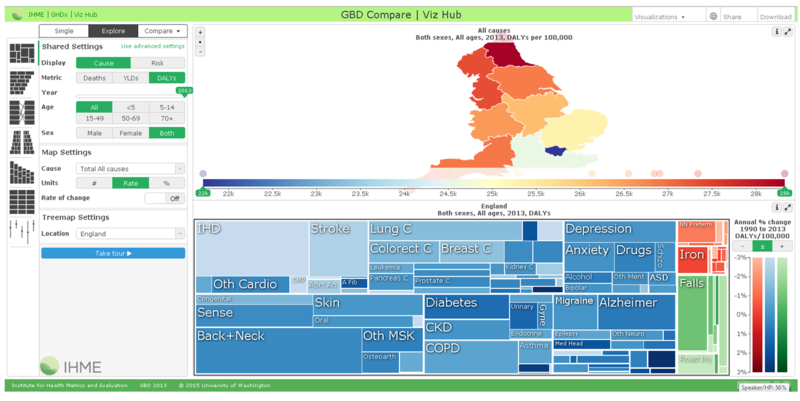 GBD Compare is a recently launched online tool that for the first time enables you to rank the burden of disease for 306 conditions from 1990-2013 by region and deprivation, along with the relative impact of 79 different risk factors. As the tool is new we’ve published a detailed blog explaining its capability. The Dementia Core Skills Education and Training Framework was commissioned and funded by the Department of Health and developed in collaboration by Skills for Health and Health Education England (HEE) in partnership with Skills for Care. It sets out the core skills and knowledge which would be transferable and applicable across different types of service provision and includes expected learning outcomes for training delivery, key policy and legal references and is aligned to related national occupational standards. PHE worked with Alzheimer’s Research UK to create a guide to reducing dementia risk. It provides useful information for professionals or anyone interested in reducing their risk of dementia. This free online course covers the symptoms and science behind four less common dementia diagnoses.